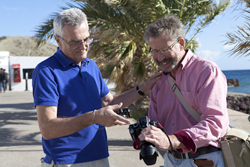 Paul has been teaching photography for many decades in higher education and was the first professor of photographic practice in a British university. He created the famous Photographers’ Place group workshops in Derbyshire and has specialised in one-to-one mentoring over the same period. He has worked as a photo-journalist and a fine art photographer, as well as a lecturer, so his experience in these fields is extensive. One-to-One Tuition is available for those who want to develop their photography and produce work that reflects their ideas and feelings. Techniques are not taught for their own sake, but in the service of those ideas. Regular one-to-one feedback is essential for those who want to advance their practice and produce images that are of a standard that can be exhibited and published. Sessions take place in Bradbourne, Derbyshire, or in the comfort of your own home, if it can be arranged. On Location with Paul Hill provides a stimulating way to explore different locations and produce work on specific themes relevant to the participants’ ideas and interests. They run from 10.00am to 4.00pm in the Derbyshire area and the Peak District National Park, amongst others*. Cost: £ 295 per day for one person, £ 350 per day for two people, £ 410 per day for three people.